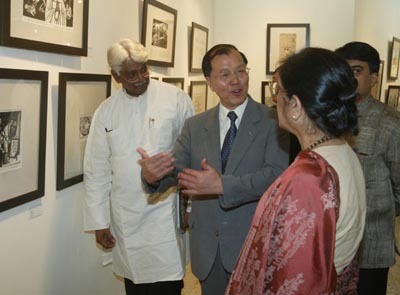 Ambassador Hua Junduo Present at Inauguration of "Selected Chinese Prints of the 20th Century"
The Chinese Embassy in India sponsored the "Selected Chinese Prints of the 20th Century" in New Delhi to celebrate the 55th anniversary of the founding of the People's Republic of China. The inauguration was attended by Chinese Ambassador to India Hua Junduo, Indian Cultural Secretary Neena Ranjan along with some 200 people including Indian friends from all walks of life, diplomats from diplomatic corps, Chinese Indians and overseas Chinese in India. 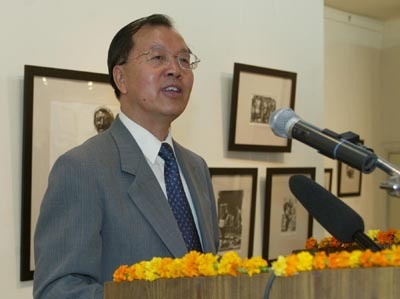 Ambassador Hua expressed in his speech that India and China had friendly exchanges of 2000-odds years. Continuous cultural exchanges helped the two great nations enrich and develop their own cultures. The exhibition would be beneficial to deepening the understanding and friendship between the two peoples and giving impetus to the cultural exchanges and cooperation of the two countries. He also briefed the guests on the 2000-year history of woodblock print art. 100 print art works which were selected from thousands of art works of the 20th century would be showcased in the exhibition for one week.